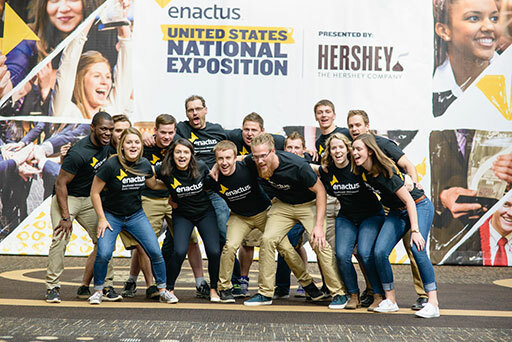 With nearly 2,500 people in attendance, something special happened in St. Louis a few weeks ago when student, faculty and business leaders from across the country all came together for the 2016 Enactus USA National Competition. Those three days—15 to 17 May— provide us with a vivid example of the power of the Enactus community and the amazing things that can happen when dedicated people come together to showcase and celebrate the impact made by entrepreneurial action. 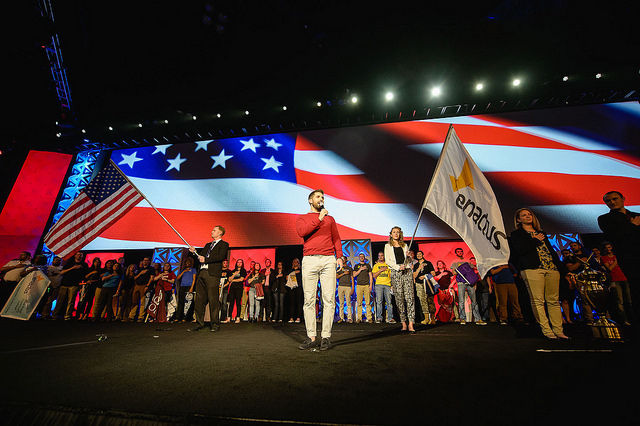 The event kicked off with the always exciting Rally of Champions: whether you are a first time attendee or a veteran Enactus USA supporter, there is nothing quite like these opening ceremonies. New this year was the addition of a host to help facilitate this ceremony and others: attendees were treated to the talents of Jeff Houghton from the Mystery Hour who not only facilitated the evening but put together this great video with students. A number of project partnership and topic competition awards were handed out, including ADP Veteran Empowerment, AIG Wellness at Work, Walmart Foundation Women’s Economic Empowerment, and R.W. Plaster Free Enterprise Challenge (whose winner, Benedictine College, won $10,000!). You can find the complete list of awards, winners and participants here. Another highlight: Enactus USA’s own Stephen Robertson, Director, Programs, sang the national anthem and if the comments on social media are any indication, it was not to be missed! The following day was the opening round of competition, which saw 119 regional champion teams put forward their best presentation in hopes of moving on to the next round and getting one step closer to the national title. More than 200 executives took part and had the difficult task of selecting the top twenty teams. The impressive Career Fair also took place that day with more than 40 of the country’s leading companies in attendance. Students had the chance to visit with recruiters, many of them Enactus alumni themselves, to learn more about the companies, their cultures and career opportunities. Companies weren’t the only ones represented in the Career Fair this year: for the first time ever, there was an Alumni booth where graduating seniors could get information about how to stay involved after graduation. There was also the first in-person meeting of the Alumni Advisory Group, and Unilever hosted a special reception for all alumni and graduating seniors at the event. At the end of the day two, attendees gathered together again to find out which teams would be moving on to the semi-final round. Before that, however, faculty advisors were recognized for the important role they play in the success of the program including the presentation of the Sam Walton Fellow of the Year award. Next, attendees had the opportunity to hear from two amazing speakers: the first was Lynne Doughtie, Chairman and CEO of KPMG US, who shared with students her advice for a successful career (check out her complete speech here). It was clear from the posts on social media that the audience was touched and inspired by her words; but it seems like she had a similar reaction being a part of the event! With Enactus’ commitment to advancing the UN’s Sustainable Development Goals, this event was the perfect opportunity to further explore this ambitious and important agenda, while deepening the connection between our two organizations. Enter Aaron Sherinian, Chief Communications & Marketing Officer for the UN Foundation, who shared more about the goals themselves and the progress we are making. In that spirit, teams had the chance to share what they are doing to advance the SDGs, as well as write messages of thanks to the companies who generously support their work. Finally, the top 20 teams moving forward to the next round of competition were announced, resulting in a flurry of messages on social media, filled with excitement and anticipation. Of course, in true Enactus spirit, many of those teams that weren’t named a semi-finalist had positive words to share about their experience and the impact they had. Inspiring! Even though we did not make it to the semifinals, we are proud of our achievements and look forward to next year! Thank you #EnactusUSA ! Day three was jam packed starting with the semi-final round of competition and various forums in the morning followed by the announcement of the final four teams in the main ceremony room. After the finalist teams from Flagler College, Heritage University, John Brown University and La Sierra University wowed attendees with their impressive presentations, 93 top business leaders had the difficult task of selecting the national champion. 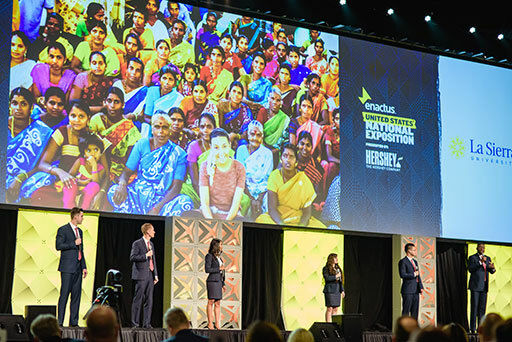 In the end, La Sierra University came out on top, impressing judges with their micro-loan and small business training initiative in India as well as their work addressing food deserts in their local community through their Mobile Fresh project. Perhaps one of the most emotional moments of the day was the tribute to long-time Enactus CEO Alvin Rohrs who recently announced his retirement. Students, faculty and executives shared their heartfelt messages of gratitude and thanks for his impact on the organization. So much happened in St. Louis, we couldn’t capture it all here! Did we miss any of your favorite highlights? Share your memories in the comments! 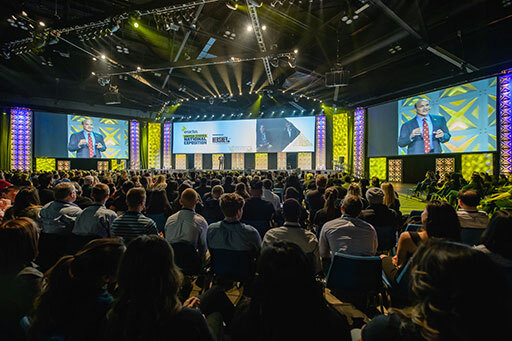 Watch all the highlights from this year’s Enactus USA National Competition in this great flashback video, and find more videos from the event here!